Isabel Fletcher in Science & Technology on 22 November, 2016. 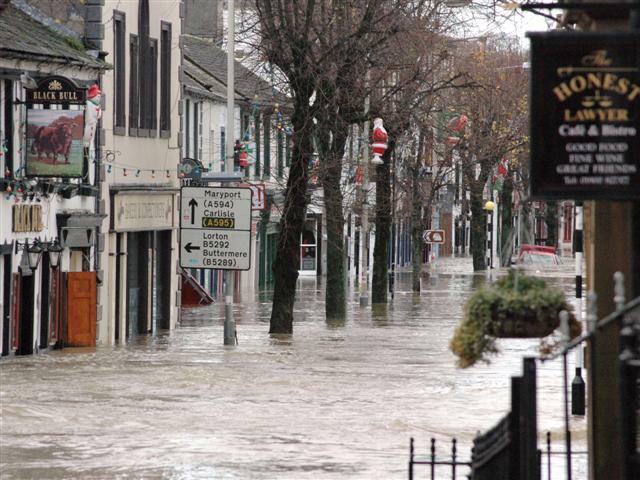 Extreme weather events, such as flooding in the UK, are exposing increasing numbers of people to mental health problems. As an ecologist, I’m forever surrounded by climate change, particularly the devastating impacts it is having and will have on global biodiversity. We are constantly being reminded that human-induced climate is having an irreversible effect on our planet and that we are losing precious ecosystems at an alarming rate. It is predicted that current species loss is between 1,000 and 10,000 times higher than the background extinction rate that we would see otherwise. So why aren’t we doing more? It’s especially difficult for privileged people like us, living in a highly developed country where the effects of climate change are diluted by technology and our own development. However, it is those who contribute least to anthropogenic climate change that suffer the most; this is the inequity of climate change. There may be another way we can encourage climate change mitigation in countries who are contributing the most. A new annual report, The Lancet Countdown, will be launched at the COP22 climate talks. The countdown aims to track the impacts of climate change on global public health, and speed the transition to a decarbonised global economy. There is a huge effort to mitigate climate change in order to alleviate the impacts on animals and plants, but what about humans? There is evidence that mitigating climate change could actually have a wide variety of health co-benefits to humans. So how is climate change impacting public health? Well firstly there are the more direct impacts; climate change is exposing more and more of us to extreme weather events, such as flooding, tropical storms and heatwaves. This is not only increasing mortality but exposing a significant amount of people to psychological illnesses associated with direct trauma and future environmental uncertainties. This in itself is putting further strain on global public health services. There are also the more obvious problems; climate change is increasing the transmission and distribution of some disease vectors, such as malaria and dengue fever. Increasing temperatures are increasing rates of pathogen maturation and replication within mosquitoes and increasing the likelihood of human infection. Malnutrition, diarrhoea and cholera incidences are also expected to increase, through decreases in crop yields, water shortages and contamination of freshwater sources. I could go on as there are many more ways in which climate change is damaging public health, but now it’s important to show you why acting against climate change will be so beneficial to our health. A low-carbon economy could bring many a great thing; in our modernised society there are extremely high rates of weight-related diseases and conditions, which could be reduced by lessening our carbon output. The NHS spends around £4,000 a minute on treating diseases that could be prevented by regular physical activity. Therefore, in a low-carbon economy with moderated road traffic, conditions such as obesity and diabetes may be reduced through encouragement of increased exercise. With this, lowered air pollution could reduce incidences of respiratory disease, road traffic injuries and some cancers. Additionally, with greener agricultural technology and a decreased consumption of animal products, saturated fat intakes and resultant ischaemic heart disease would be lowered. This would directly benefit public health, by minimising spending on avoidable conditions that can be affected by lifestyle changes. These health co-benefits should be a big incentive as any to combat climate change. The countdown, in my opinion, is a great way engage the public in climate change mitigation. Instead of bombarding the public with the endless facts and figures on the species and ecosystems we are threatening by continuing with ‘business as usual’, we should not alienate those that are fortunate enough to bear the full brunt of climate change. By valuing the co-benefits of climate change mitigation on public health and realising the benefits, we can all relate and be motivated enough to contribute even just a small amount to a low-carbon economy. In this way we may all reap the benefits of action against climate change. I was initially surprised that the countdown has not been more heavily publicised, but thinking about it this should not be the only reason why developed societies should act on climate change. This should be yet another wake up call, another incentive to kick-start mitigation. We share our planet with other species, so although mitigating against climate change for our own sake is a valid incentive, it should not be the only reason. We must not forget that many of the species we will lose to our own anthropogenic destruction, are in fact providing irreplaceable services to fund our unsustainable modern societies.